Adobe Lightroom: The most powerful way to organize and edit your photos! Lightroom has profoundly improved my life as a photographer. Lightroom combines vital features under one umbrella: organization, workflow, non-destructive editing, real-time editing, seamless integration with Photoshop, local adjustments without using layers, plug-ins for web publishing, Blurb integration for book layouts, and much more. Working with tens of thousands of images in Lightroom is like a hot knife through butter. By streamlining the tedious aspects of image management and editing, Lightroom enables you to concentrate on what you really want to do: enjoy the creative process of working with your images. Since its introduction in 2006, I've used Lightroom on a daily basis — please feel free to visit my photography portfolio and my Instagram account to see examples of images I've edited in Lightroom. 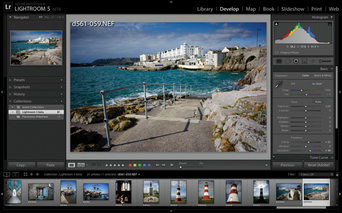 Also check out the wealth of information about Lightroom provided by Adobe. Which is best for me, Lightroom Classic CC or Lightroom CC? Why are some of my photos missing, i.e. displaying an exclamation mark icon? Why did my photos end up in a completely unexpected folder? Can I also edit my Lightroom images in Photoshop? How do I use collections and keywords? I have too many photos and am running out of space on my Mac — what do I do? Can I email photos directly from Lightroom? Why do I have multiple catalog files? How do I back up my Lightroom catalog and all of my photos? iPhoto — Great for beginners and superbly integrated with the Apple ecosystem, but if you want to go deeper into digital photography, you'll want more powerful tools. Photos — Apple's successor to iPhoto has some great new features, such as syncing your entire library across multiple devices through iCloud, and the ability to edit your images in third-party apps. Aperture — Once a competitor of Lightroom, Apple has now officially ceased development. Apple and Adobe have provided a tool that enables Aperture users to migrate their libraries to Lightroom. Adobe Bridge — Before Lightroom, Bridge was a reasonable solution for organizing and keywording your photos, but actual editing was performed with an external app of your choice. Now that we have Lightroom, there's really no reason to use Bridge anymore. Adobe Photoshop — The absolute pinnacle of digital image editing software, but with a steep learning curve to match, it offers no means of organizing your images. You'll find that Lightroom meets most of your image editing needs, but when you do need Photoshop for advanced techniques, it's perfectly integrated for "round-tripping" with Lightroom.